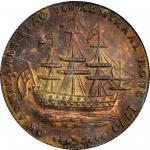 1739Higley鹿图案铜币 PCGS G 4。1739 Higley Copper. Freidus 3.3-D, Crosby-26, W-8285. Rarity-7. VALUE ME AS YOU PLEASE / J CUT MY WAY THROUGH, Broad Axe. Good-4 (PCGS). CAC.；An exceptional coin for the assigned grade, and a highly desirable example of a historic early American copper rarity. Both sides are warmly and evenly toned in bold reddish-brown patina with none of the pitting, corrosion, or other forms of environmental damage so common to Higley coppers. Wear is commensurate with the assigned grade, the obverse displaying more detail than the reverse. 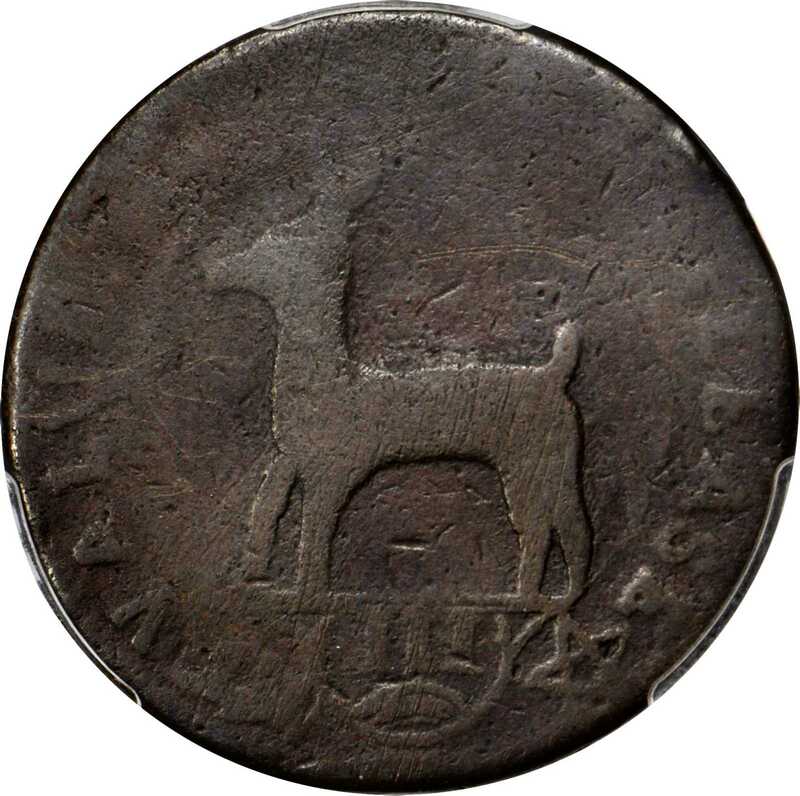 On the former side the deer is fully outlined, if the antlers are a bit weak, the words VALUE and PLEASE in the peripheral legend are partially legible, the Roman numeral III is discernible, as are the adjacent curved lines and five-pointed star. For the reverse we note a faintly outlined axe and, while most other peripheral devices have been lost to wear, the all-important date is clear with the digits 173 particularly bold. The in hand appearance of this piece is quite smooth, especially for such a heavily circulated Higley copper, although a small disturbance at the upper reverse border is readily evident. As well, closer inspection reveals several wispy pin scratches and tiny surface nicks on both sides, none of which we deem worthy of singular note. All in all, it is difficult for us to imagine a more technically sound and aesthetically pleasing Higley copper at this level of preservation.<p>Higley coppers are eagerly sought by advanced numismatists as one of the earliest copper pieces produced in what would eventually become the United States. The 1739-dated issue comes in three distinct varieties, all of which share the same reverse with the date 1739, peripheral legend J CUT MY WAY THROUGH, and a broad axe serving as the focal device. This is Reverse D as described by Dan Friedus in his important work <em>The History and Die Varieties of the Higley Coppers</em>, published in 1995 and based on his presentation at the American Numismatic Societys Coinage of the Americas Conference the previous year. Only 14 specimens of the date are known, divided into three die pairings based on differing obverses, as follows:-Friedus 3.1-D: unique, and offered in our (Stacks) sale of the Henry Leon Sale, May 2007, lot 352.<p>-Friedus 3.2-D: six specimens known.<p>-Friedus 3.3-D: seven specimens known, including the present example. At least four of these coins are permanently impounded in museum collections, leaving precious few examples for private collectors. Most of the survivors are well worn, as here, with grades of Good and Very Good most often seen. Whether one is a type collector of Colonial era coinage or has more ambitious goals of assembling a date and/or variety set of Higley coppers, the present offering represents a fleeting bidding opportunity not to be overlooked.；From the Antony Bettencourt Collection. 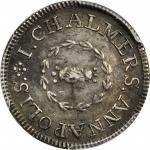 Earlier ex Numismatic Gallerys sale of the Prann Collection, August 1947; Eric P. Newman Numismatic Education Society; Heritages sale of the Eric P. Newman Collection, Part IV, May 2014, lot 30369.